The sun beamed into The Ruby Apron kitchen through a bank of windows at the back of the home, that looked out onto a backyard oasis full of lush greenery, a soothing waterfall feature, and planters brimming with edible goodness. 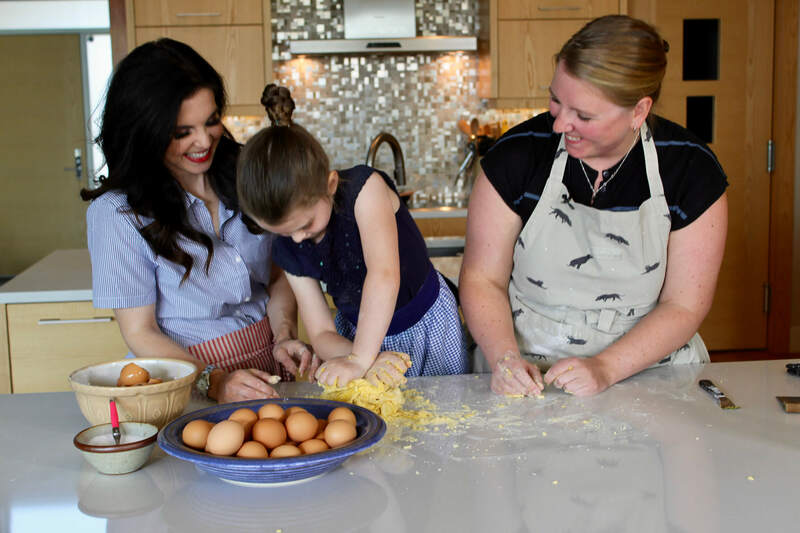 Chef Kaelin Whittaker, founder of The Ruby Apron blog and cooking class host welcomed Cela and I into the heart of the kitchen where she finds inspiration, tests out recipes and explores new ideas with food. 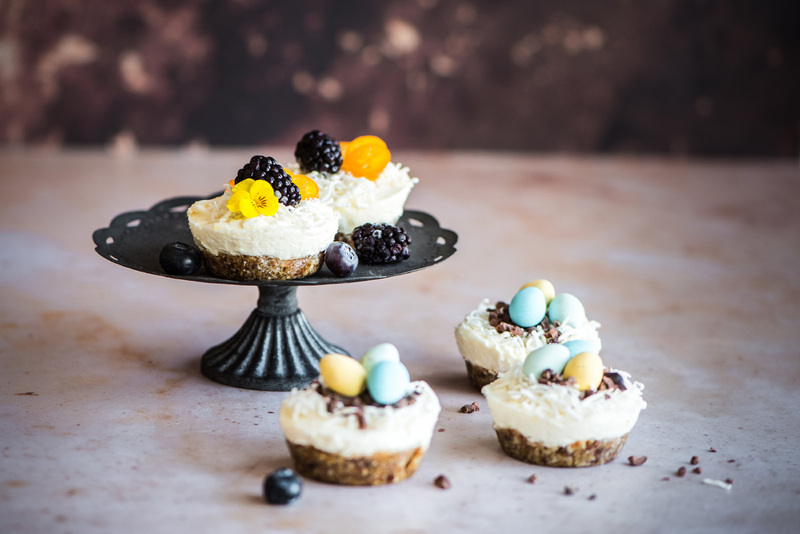 After our recent trip to Sunworks farm we were eager to use our beautiful farm fresh eggs to create two delicious dishes where this beautiful ingredient could really shine. 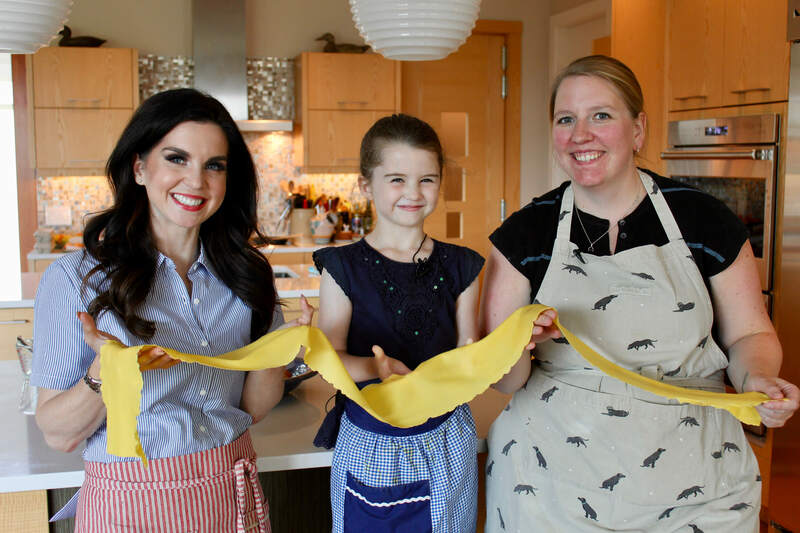 Kaelin is a big proponent of the ‘back to basics’ cooking style, telling us food doesn’t need to be complicated to be delicious – and her recipe for pasta was just that. Using only three simple ingredients; eggs, flour and a touch of salt, Cela and I rolled up our sleeves and got to work bringing the dough together. For this recipe Kaelin recommends an organic flour, grown and milled right in Alberta, called Highwood Crossing. 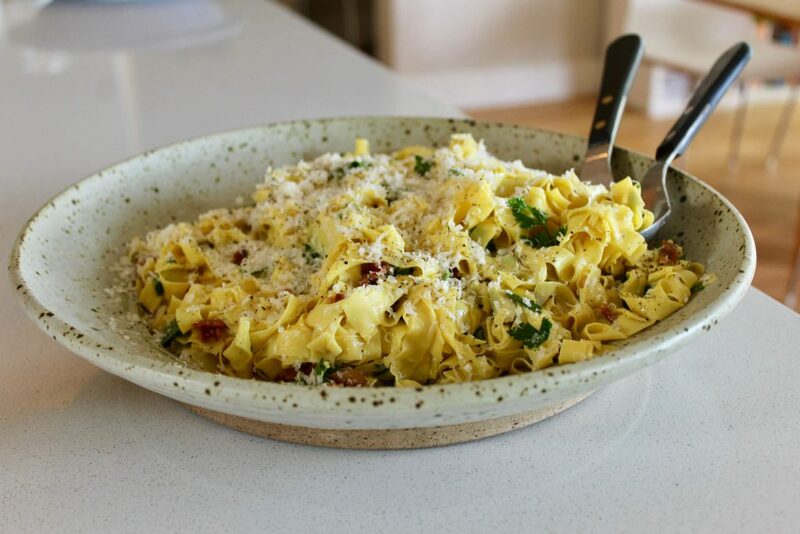 We top off the pasta with fresh parsley snipped straight from the backyard garden, the always mouth-watering Irvings Farm Fresh bacon and more egg to bring the carbonara together. 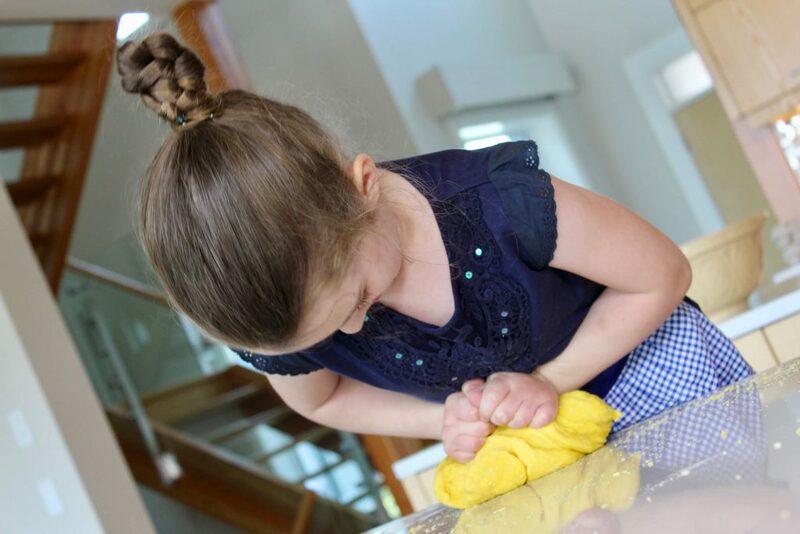 Mix the flour and salt together on a clean work surface. Make a well in the centre and crack your whole egg, and 12 egg yolks into the centre. Using a fork, slowly whisk the eggs, bringing in bits of flour from the edge. You will hit a point where you’ll notice the fork isn’t working as well, clean the fork off and switch to your hands. If the dough isn’t coming together, add another egg yolk. The dough should be crumbly and extremely hard to work with at first (almost as if it won’t come together), through kneading, the dough will transform into a beautiful, golden, smooth dough. Knead the dough by hand for 10 – 15 minutes until you can no longer see any white running through and you have a firm ball of dough. Wrap in cling film and rest for at least 30 minutes before rolling. 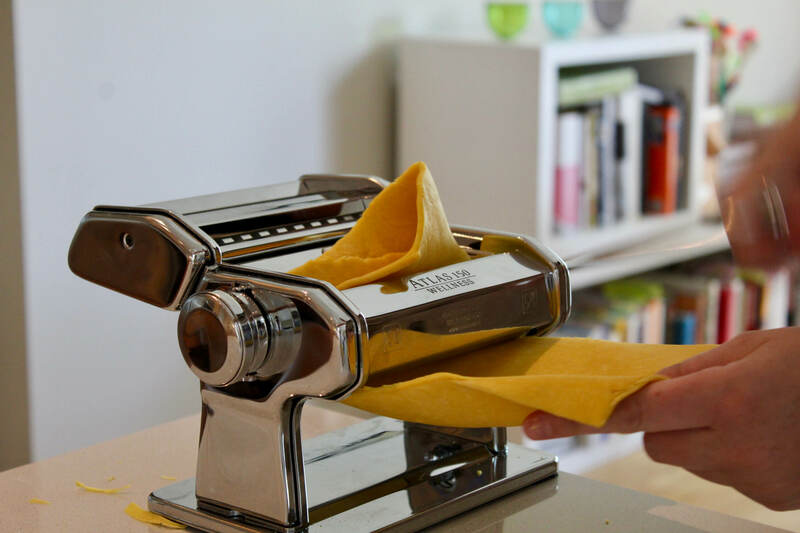 To roll the dough, begin with a 200g piece of dough, and roll it through the widest setting on the pasta machine. Fold one third of the dough over itself from the left, and the other third over itself from the right, gently press, and roll through the machine again. Do this four or five times until the dough is a consistent colour and no longer breaks. In a sense this is the second knead on the dough after the gluten has had time to rest. At this point you can begin to roll it through each setting, I roll it from 0 – 3, twice per setting, and from 4 – 8 once, and through the last setting twice. 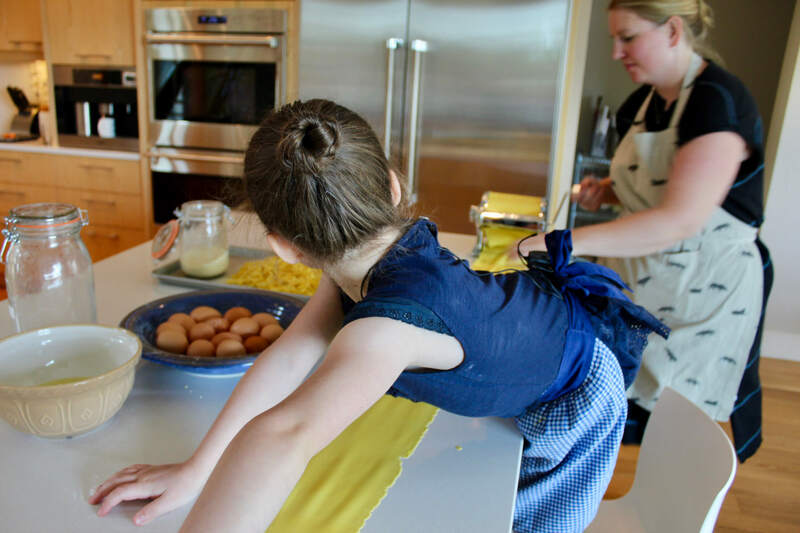 You can then use the dough for a filled pasta, or cut it into whatever shaped noodle you wish. Be sure to coat the noodles in semolina to ensure they don’t stick together. Cook the pasta in well salted water until tender. Cook your pasta in well salted water to the package instructions, being careful not to overcook it. Meanwhile, prepare your bacon, and fry until crispy, drain on paper towel. In a mixing jug, whisk your eggs, add the parmesan, chopped parsley, salt and pepper, mix well. Once the pasta is cooked, drain, reserving half a cup of the cooking water. Immediately place the pasta back into the pot, off the heat, and add the egg mixture with a ladle full of cooking water. Mix well. The heat from the pasta will cook the egg, but you do not want to scramble the egg, you want the egg and cooking water to emulsify and create a sauce. Taste, correct seasoning adding more salt and pepper if needed. Preheat the oven to 300F. 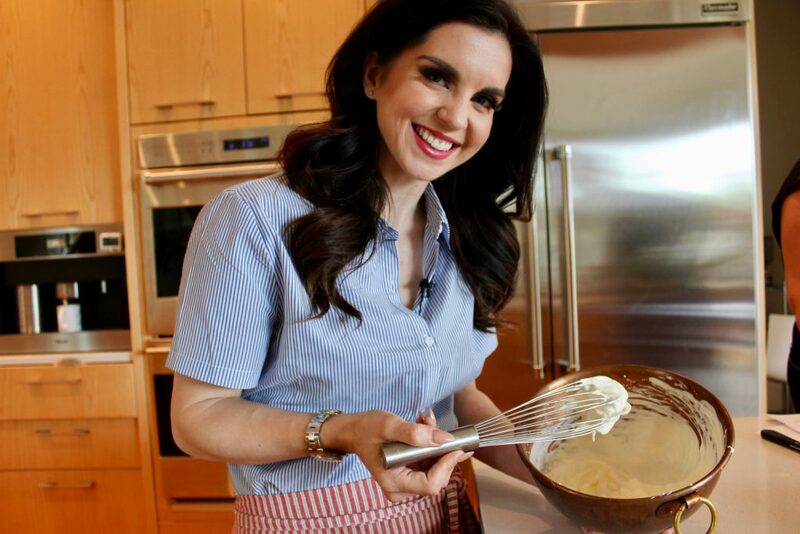 Whisk the egg whites until just broken, continuing to whisk on medium, and begin to add the sugar one tablespoon at a time. Whisk until the meringue is thick and glossy, you want stiff peaks. Don’t read too much into the “stiff peak,” as soon as it’s thick enough to hold the bowl upside down without the meringue sliding you have the right consistency. It can be misleading and very easy to over whisk. Line a baking tray with parchment, using a spatula, tip all of the meringue onto the centre of the tray. Using the spatula, smooth into a round with a slight dip in the middle. Swirl the meringue around the edge with a skewer lifting up to get little peaks. Place in the oven, and immediately turn the oven down to 275F, bake for one hour. If you can, leave in the oven until the meringue is completely cool. You can make this the night before, bake it, turn the oven off and leave it in the oven overnight to completely cool. 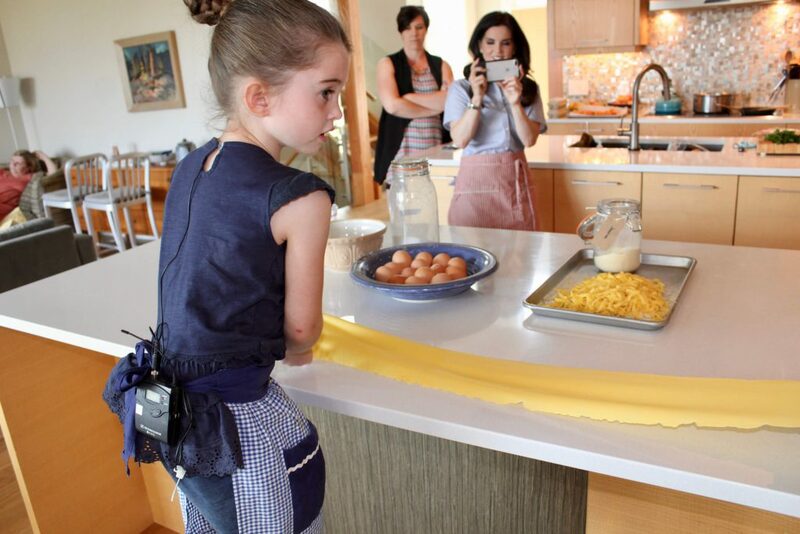 It was truly a pleasure to cook with Kaelin and find out more about her philosophies and about The Ruby Apron. There’s no amount of fancy ingredient or complicated method that could replace the goodness of simple fresh food brought together in a meaningful way. Also, a big thank you to Egg Farmers of Alberta for making our food trip to Sunworks and this cooking journey possible, we could not do what we do without our amazing Getjoyfull partners and friends. Don’t forget to fill up on family time everyone!